Licensed Battlefield Guide Eric Lindblade was born and raised in North Carolina. He began his study of the Civil War after a trip to Gettysburg when he was six years old. He attended East Carolina University and is the author of “Fight As Long As Possible: The Battle of Newport Barracks” (2010). His next book “The 26th North Carolina, 1861-1865: A Regimental History” is expected to be released in 2018. Eric is the host for our series on the 26th North Carolina. If you would like to contact Eric, you can click here to reveal his email address. He is standing next to the regiment’s monument on Meredith Avenue.This view was taken facing north at approximately 8:30 AM on Wednesday, March 29, 2017. A map showing the location of Video #1 (right pin) and Video #2 (left pin).This map was created in a chair facing east on April 1, 2017. 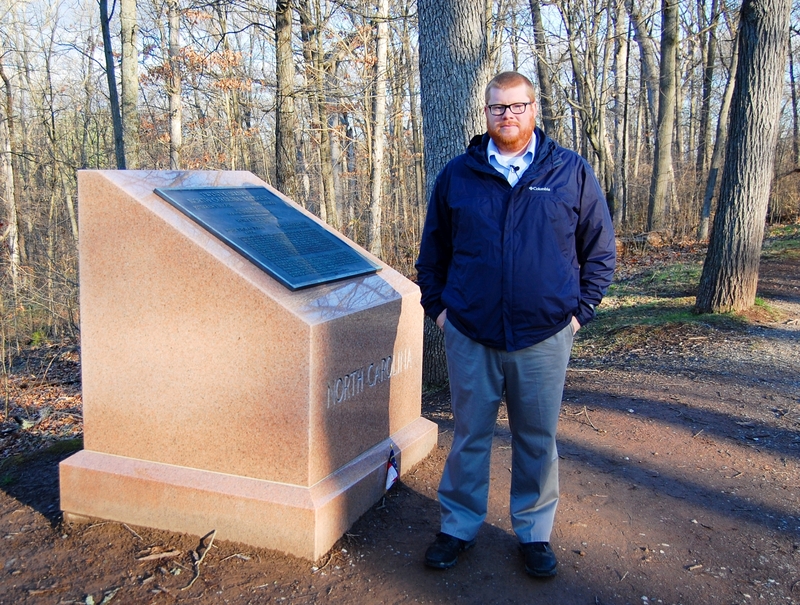 Eric is standing by the monument to the 26th North Carolina Infantry along Meredith Avenue in Herbst’s/Reynold’s/McPherson’s Woods for Video #1.This view was taken facing north at approximately 8:30 AM on Wednesday, March 29, 2017. The ten companies of the 26th North Carolina were raised primarily from the counties highlighted in red. Two counties raised two companies for the 26th: Caldwell (Companies F and I) and Chatham (Companies E and G). While often viewed as a “western” North Carolina regiment only four of the ten companies were from western counties and as the map shows the regiment was formed from three distinct regions of the state. The various companies formed between May and July 1861 and were formally organized on August 27, 1861 near Raleigh, North Carolina. Legend – A: Ashe County (Company A); B: Wilkes County (Company C); C: Caldwell County (Companies F and I); D: Union County (Company B); E: Anson County (Company K); F: Moore County (Company H); G: Chatham County (Companies E and G); H: Wake County (Company D).This map is courtesy of Eric Lindblade. 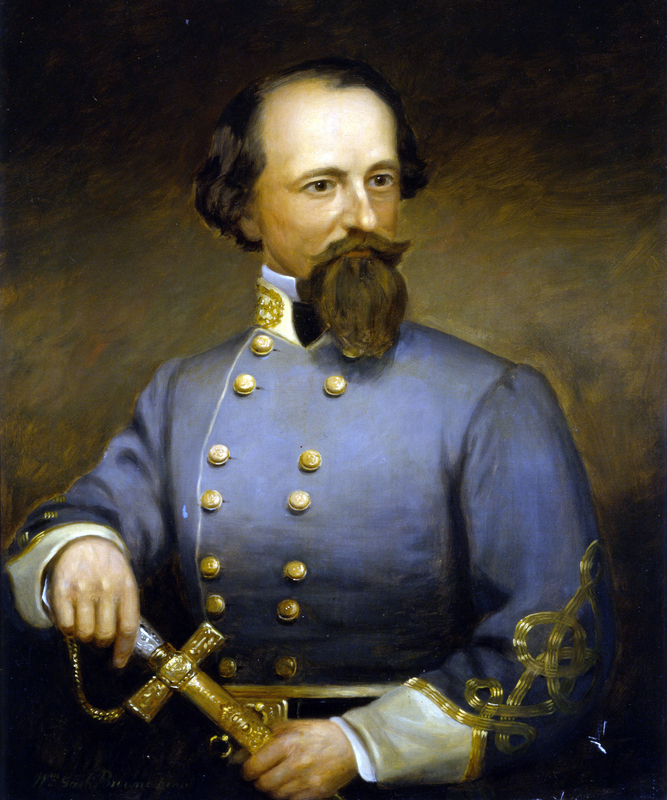 On August 26, 1862 the 26th North Carolina was transferred to the brigade under the command of James Johnston Pettigrew. In addition to the 26th it consisted of the 11th, 44th, 47th, and 52nd North Carolina regiments. Between August 1862 and April 1863 the brigade served in Eastern North Carolina and Southeastern Virginia. In May 1863 the brigade will be assigned to the Army of Northern Virginia where it joined Henry Heth’s Division of the newly created Third Corps under A.P. Hill. During the Gettysburg Campaign the 44th North Carolina was ordered to remain at Hanover Junction and was not present at the battle. The 26th North Carolina remained a part of the Pettigrew–Kirkland– MacRae Brigade for the duration of the Civil War.This image is courtesy of the North Carolina Museum of History. 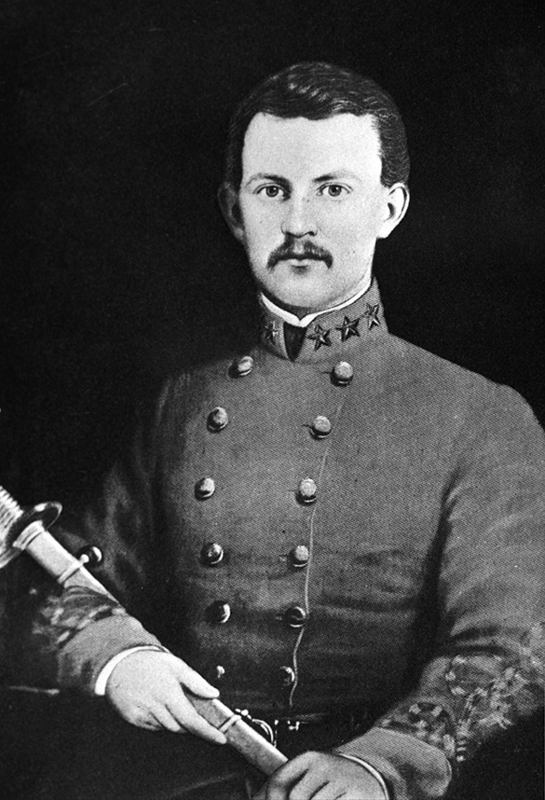 Colonel Henry King Burgwyn, Jr. was promoted to command of the 26th North Carolina on August 19, 1862. While being raised in Eastern North Carolina, Burgwyn was actually born in Jamaica Plain, Massachusetts in 1841. He was a graduate of The University of North Carolina and later The Virginia Military Institute, where one of his instructors was Thomas Jackson. At only nineteen he was elected Lieutenant Colonel of the 26th North Carolina on August 27, 1861. Initially Burgwyn, due to his rigid adherence to military discipline, was not popular amongst those in the regiment, but after his performance at the Battle of New Bern on March 14, 1862 the opinion of him changed for many in the regiment to a more positive one.North Carolina Collection Photographic Archives, Wilson Library, UNC-Chapel Hill. 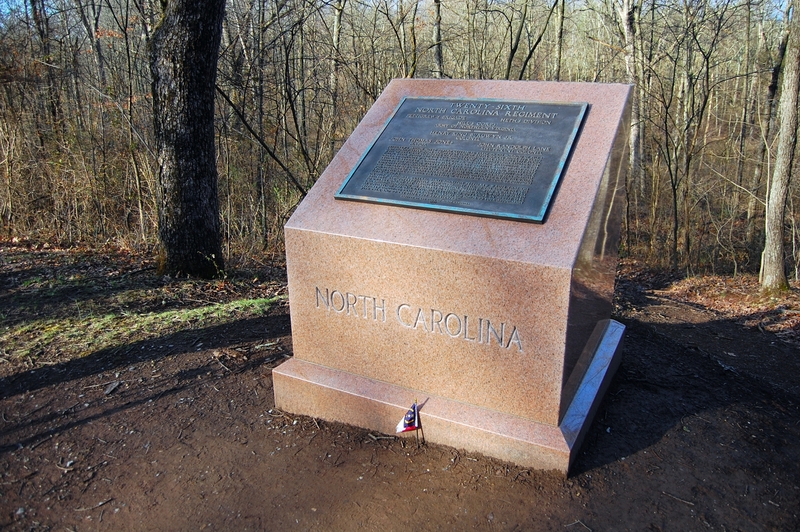 The monument to the 26th North Carolina Infantry was placed in 1985 by the state of North Carolina.This view was taken facing west at approximately 8:30 AM on Wednesday, March 29, 2017. 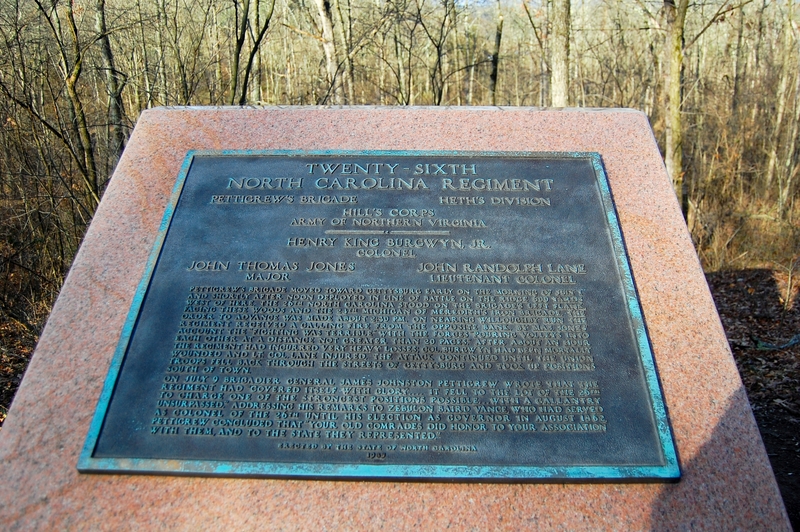 A detail of the monument to the 26th North Carolina on Meredith Avenue.This view was taken facing west at approximately 8:30 AM on Wednesday, March 29, 2017. 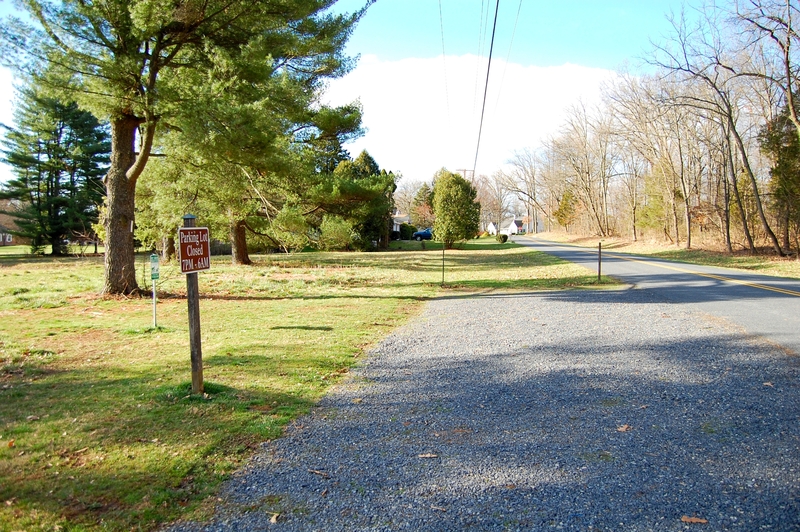 The National Park Service parking lot along Country Club Lane. The National Park Service has land on both sides of the road.This view was taken facing south at approximately 8:30 AM on Wednesday, March 29, 2017. 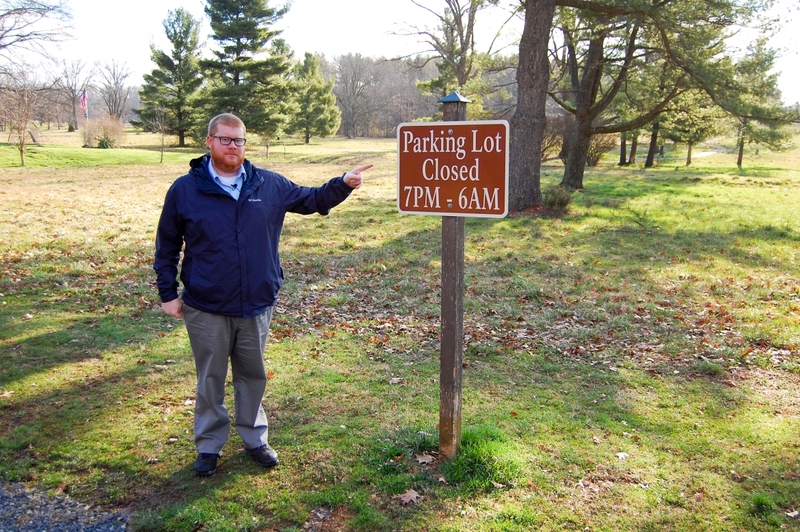 Eric is doing his best “guide point” at the National Park Service parking sign on Country Club Lane. The “Country Club Property” is in the background.This view was taken facing east at approximately 8:30 AM on Wednesday, March 29, 2017. Eric has crossed Country Club Lane and moved into the “skirt of woods” that the 26th North Carolina occupied before it advanced towards McPherson’s Woods on the afternoon of July 1st. 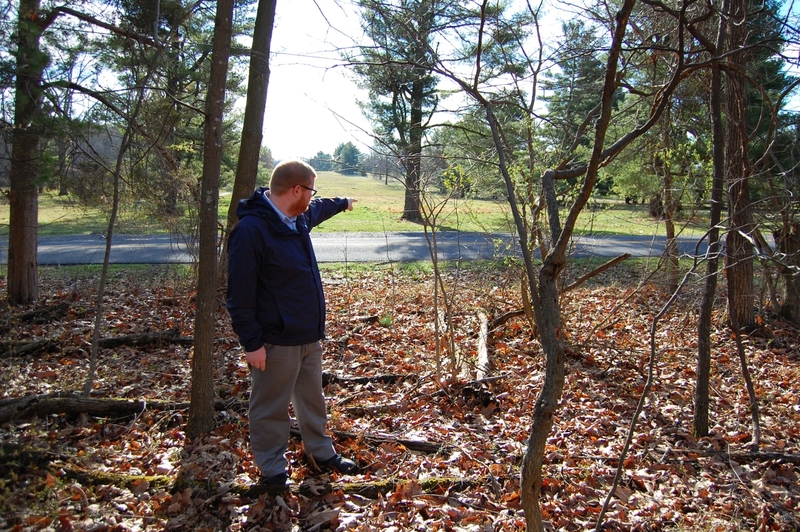 Eric is pointing in the direction that North Carolina troops in Pettigrew’s Brigade (Heth’s Division) would have attacked on July 1, 1863. This view was taken facing east at approximately 8:30 AM on Wednesday, March 29, 2017. Video #2: Eric provides a background on the 26th North Carolina’s movements leading up to the afternoon of July 1, 1863.This view was taken facing east at approximately 8:30 AM on Wednesday, March 29, 2017.